I have been eating Paleo for many months now and that means I do not eat grains. 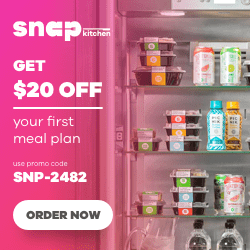 Having been recently diagnosed with celiac disease it has become clear the removal of gluten from my diet has been instrumental in the general improvement in my health. 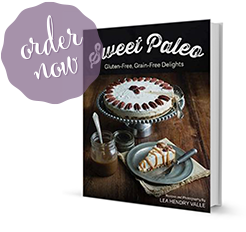 I strongly believe the benefits of Paleo go way beyond the inherently gluten-free nature of this way of eating. Having said that, I will admit a willingness to indulge in eating other gluten-free grains on rare occasion. Thanksgiving is one of those times. Now, this does not mean I am willing to throw Paleo eating out the window even if only for the Thanksgiving meal. So we will keep everything totally Paleo but for one thing – cornbread dressing. 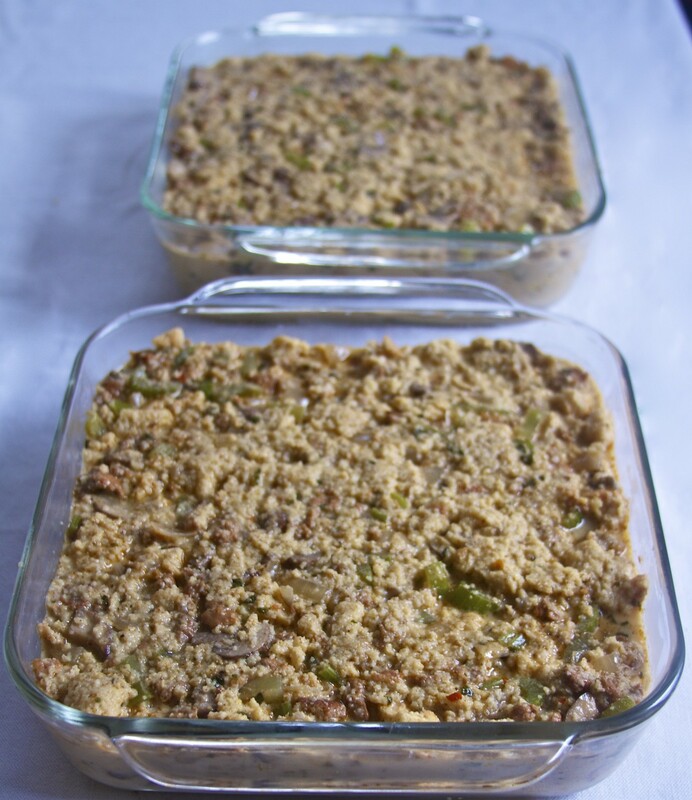 I NEED to eat cornbread dressing at Thanksgiving. It is in my genes. It just is. So I searched far and wide for a good cornbread recipe. I found one at a blog called The Art of Gluten Free Baking. The recipe ingredients and directions have been altered a bit with the specification of coconut crystals in place of sugar, Greek yogurt in place of the sour cream and more milk to thin the batter because of the extra thick nature of the Greek yogurt. 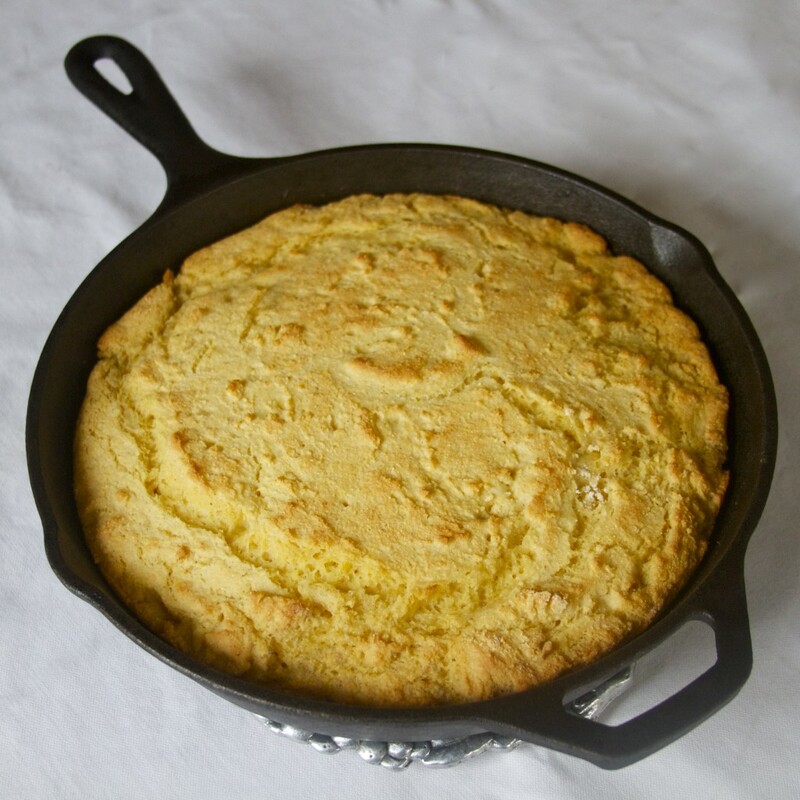 The easy recipe results in a gluten free cornbread that is very moist and tender. I like the fact it uses masa flour because it was just about the only non-Paleo food I did not throw away. 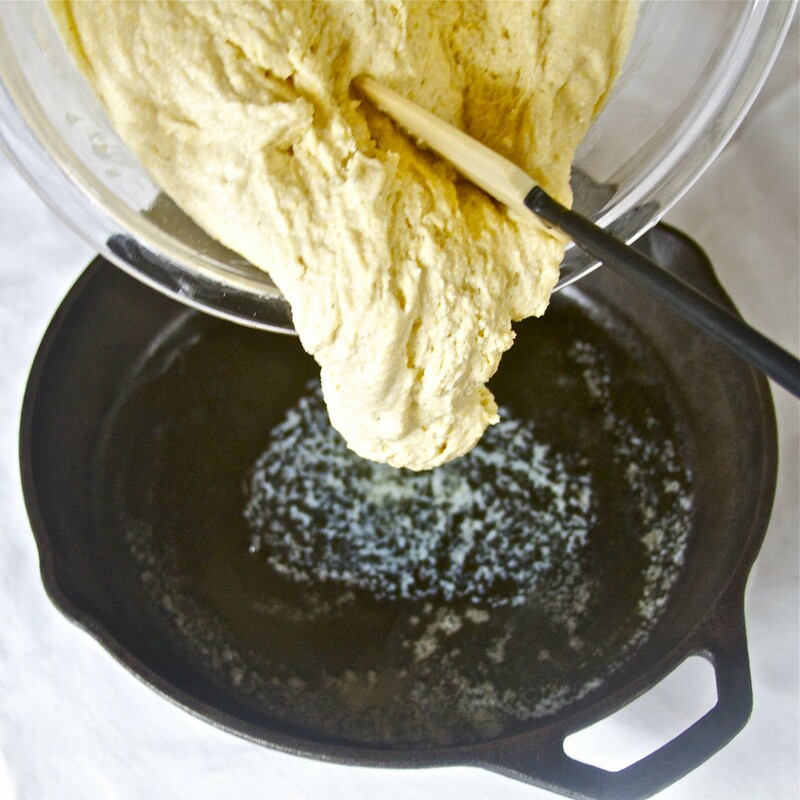 It is a very fine flour similar to regular wheat flour and is used in its place in this gluten-free cornbread recipe. 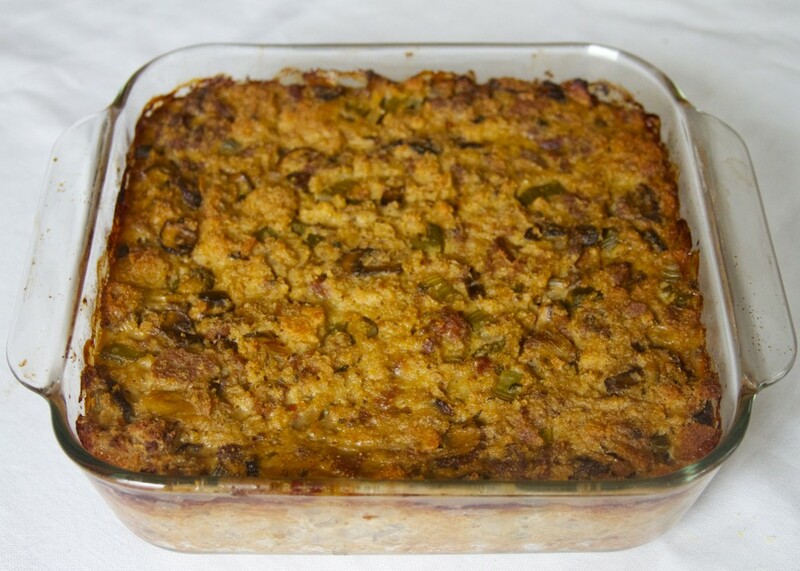 The cornbread dressing is inspired by my great-grandmother’s recipe passed on to me by my mother. I added sausage and some extra veggies and swapped out the evaporated milk for some extra chicken stock and heavy cream. I thought it turned out terrific. It was moist like a custard with a nice spicy kick from the sausage. There was a good balance of sage that was not over-powering. I will be enjoying this with my turkey and Paleo cranberry sauce and feeling not the least bit deprived. 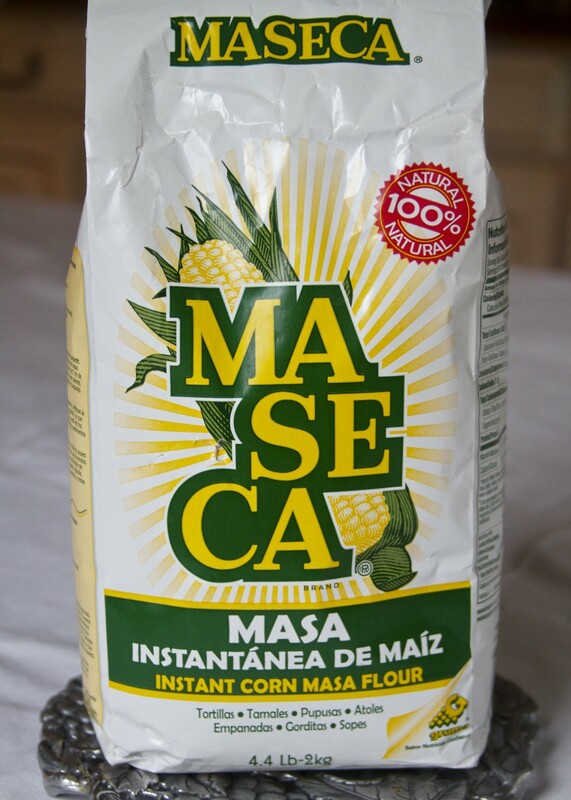 In a large bowl, combine masa flour, corn meal, baking powder, baking soda, coconut crystals and salt. In a smaller bowl, whisk together the eggs, Greek yogurt and whole milk until smooth. 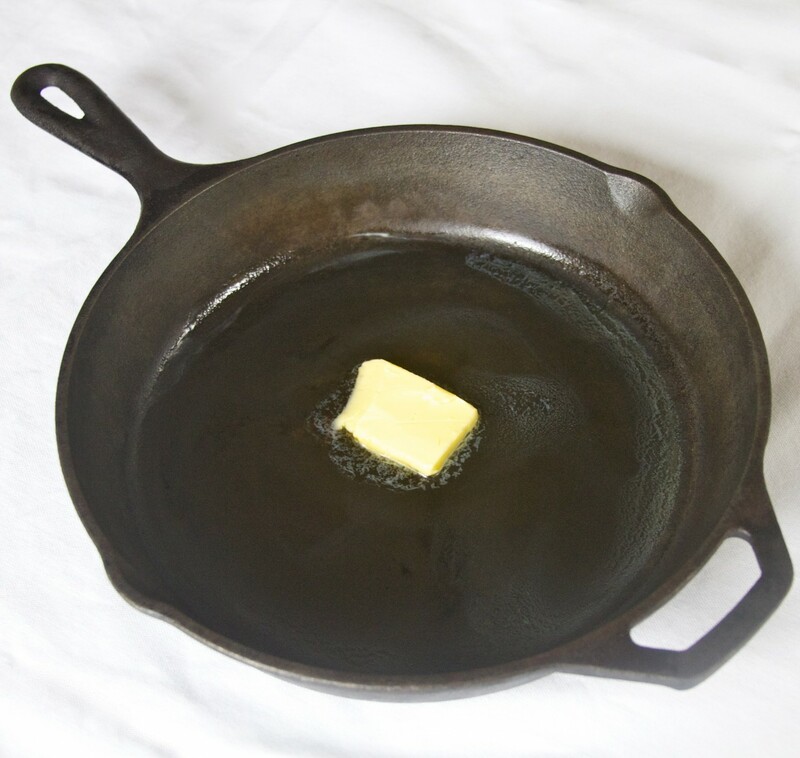 Place two tablespoons of butter in a cast iron skillet. Put skillet into the preheated oven for five minutes. Remove the hot skillet from the oven and make sure the bottom of the pan is covered with the melted butter. Pour the batter into the skillet and place back into the oven. Bake for 20 minutes or until cornbread is golden on top. 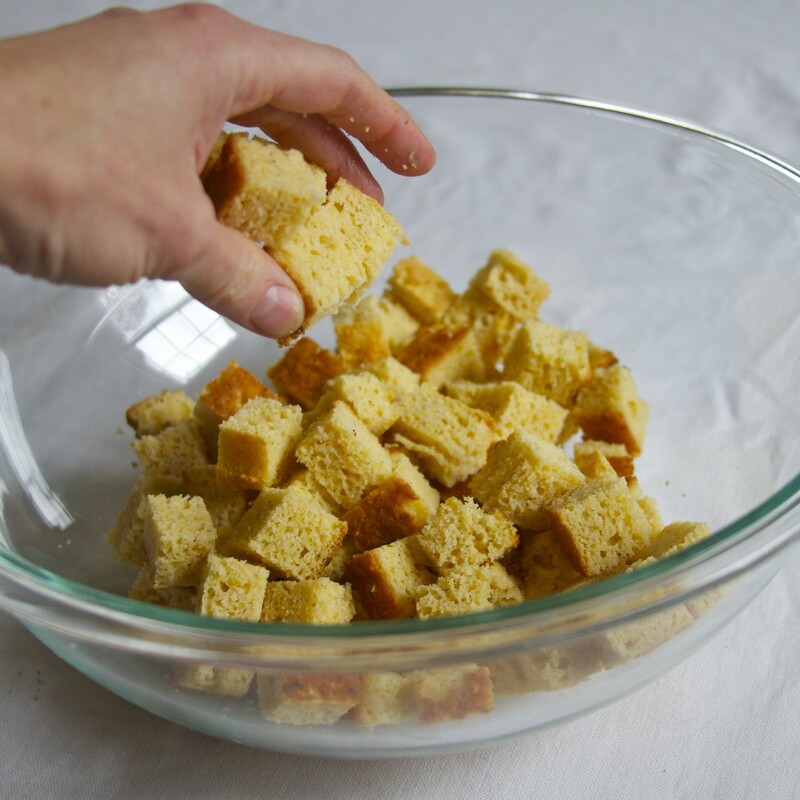 Cut the gluten-free skillet cornbread into cubes and place in a large mixing bowl. Brown the sausage in a large pan. Remove cooked sausage and set aside leaving the fat from the sausage in the pan. Add bacon fat or butter to pan and sauté the celery and onions for five minutes. Add the sliced mushrooms and continue cooking for another 5 minutes. To the pan, add the browned sausage, dried sage, fresh sage, celery seeds, salt and pepper. Pour the chicken stock into the pan, bring up to a boil and simmer for about 5 minutes. Allow to cool slightly. 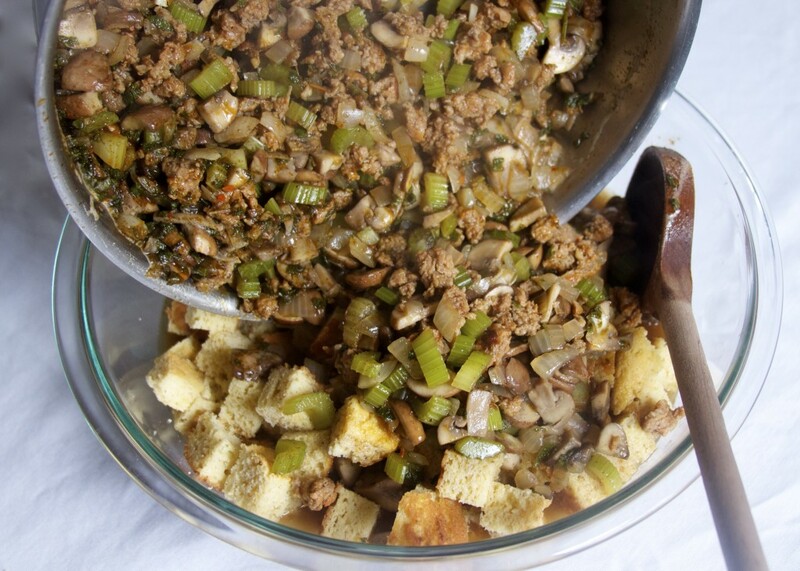 Pour the sausage and vegetable mixture over the cubed cornbread in the mixing bowl. Pour the heavy cream onto the mixture. Add the beaten eggs and gently stir until combined and the cornbread has absorbed some of the liquid. Check for proper seasoning and adjust with some sea salt if necessary. 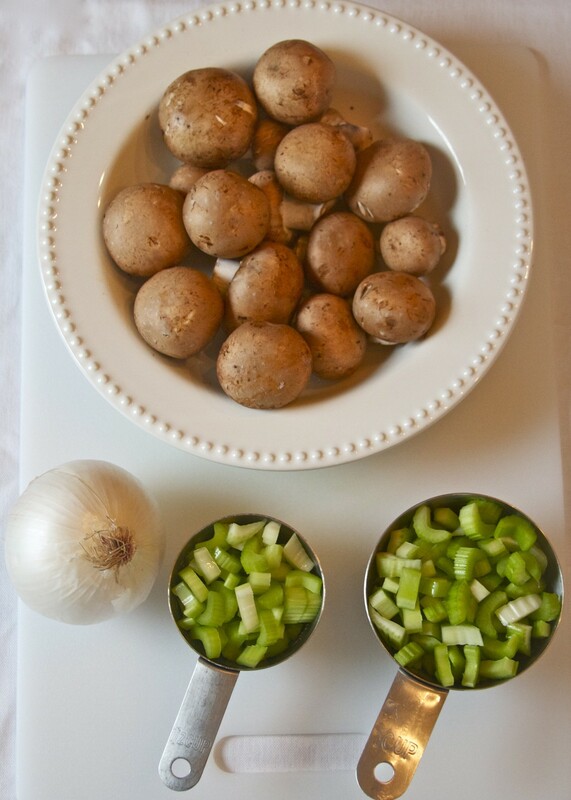 Divide the dressing mixture between two 8″ x 8″ pans that have been buttered. Bake for 1 hour and 15 minutes at 325 degrees. 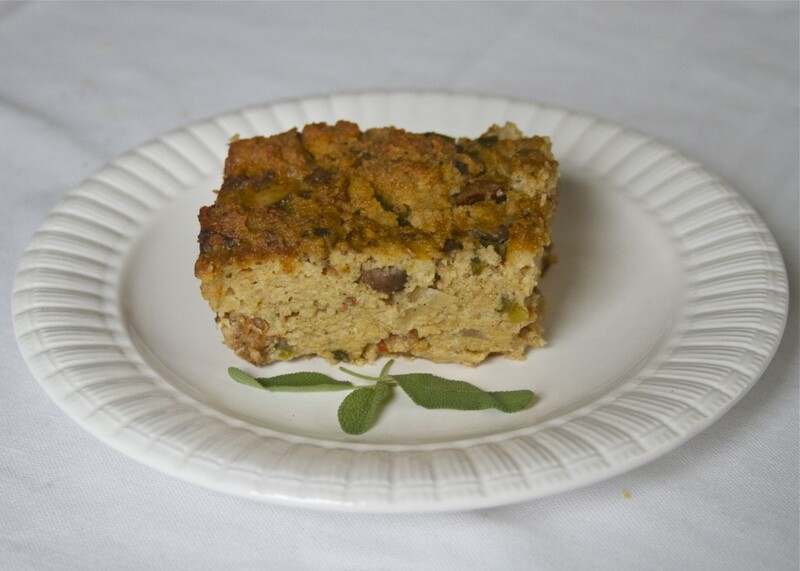 Paleo Spirit Book Review: "Beyond Bacon"
8 Responses to "Gluten-Free Skillet Cornbread And Cornbread Dressing"
any chance you know how the consistancy would change if you didn’t use the mushrooms in the dressing? The mushrooms add some moisture but it is already very moist and one reason the cooking time is so long is to firm up and dry out a bit. So I think it would be fine without the mushrooms. Yep. The good news is there are several good gluten-free and grain-free crusts for a sweet potato pie around the web. Maybe I’ll try making one myself. I know this is a new answer to a now old question, but I would chop up hard boiled eggs in place of the mushrooms. Kind of the same texture, and we always added them to our cornbread dressing anyway. Thanks Lea, I’ve been looking for a new gluten free cornbread recipe.